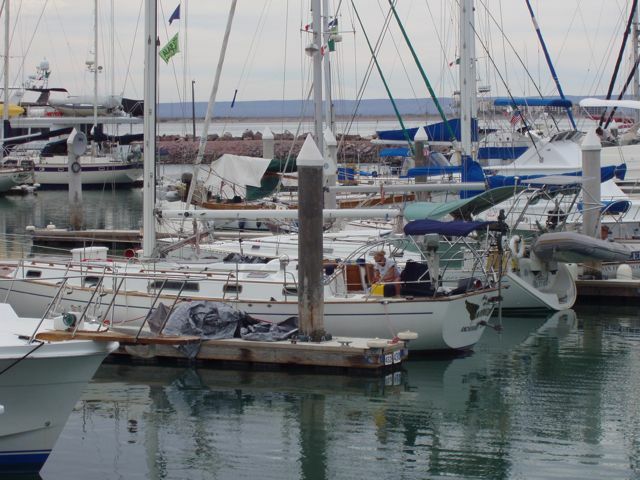 With the boat in the water, the time arrived for us to convert a sail-less hull into a cruising sailboat. While we're old hands at that set of tasks by now, it's still frustrating to live in a dark cave with mountains of stuff between you and anything you want or anywhere you want to go. These few photos illustrate the metamorphosis. 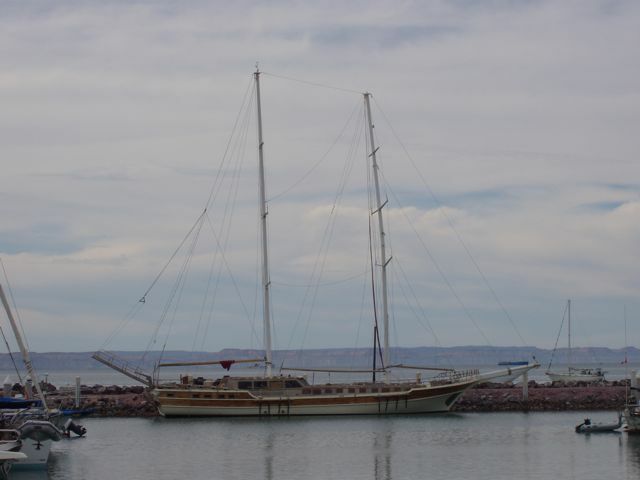 We've visited La Paz a few times and we've included some photos. 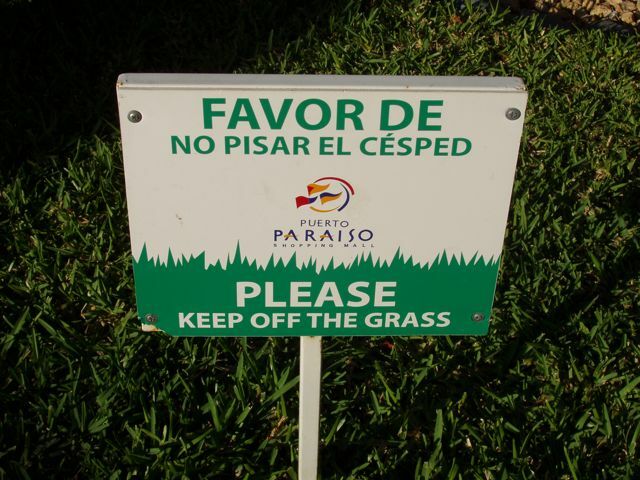 "Please don't piss on the cesped". Never would have considered it! I'd hate it, too. My apologies to Mrs. Hill, my old Spanish teacher. 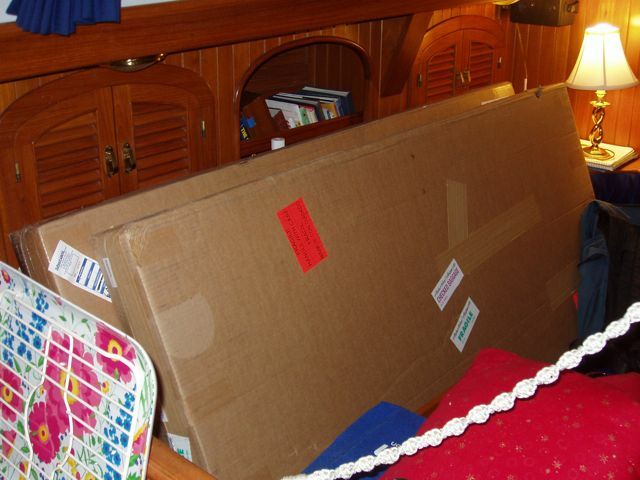 The two solar panels at rest on the portside settee. Where were my tools? In the locker behind the panels! To access them, stand on the settee, straddle the panels, lean down and open the bin. That's life aboard a boat. What a mess! 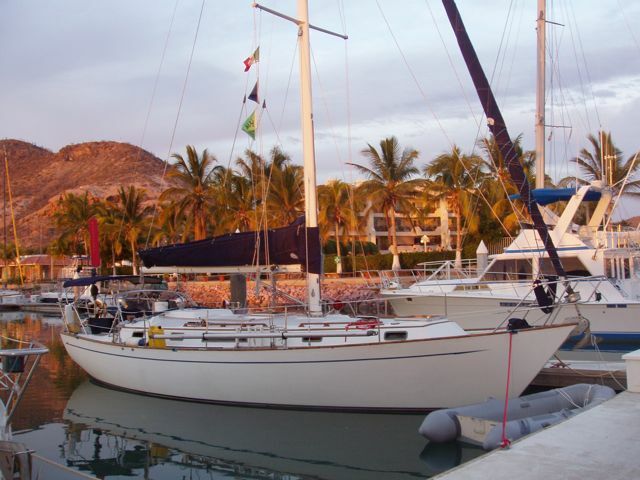 Our two sails and assorted equipment are on the dock. 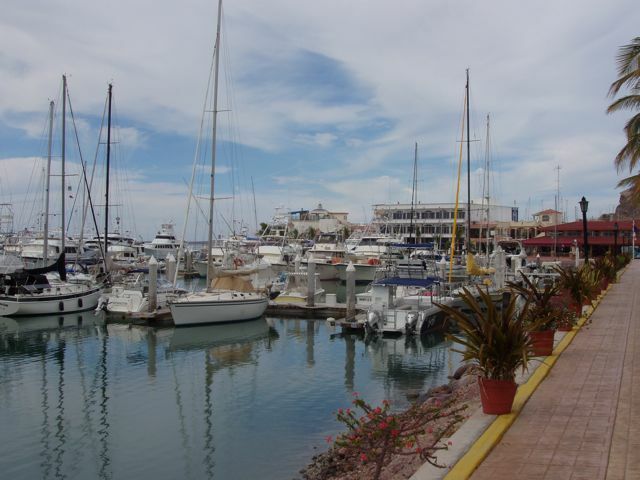 During a day trip into La Paz, we stopped by Marina de La Paz. Lovely Conni strides into the Marina gates. 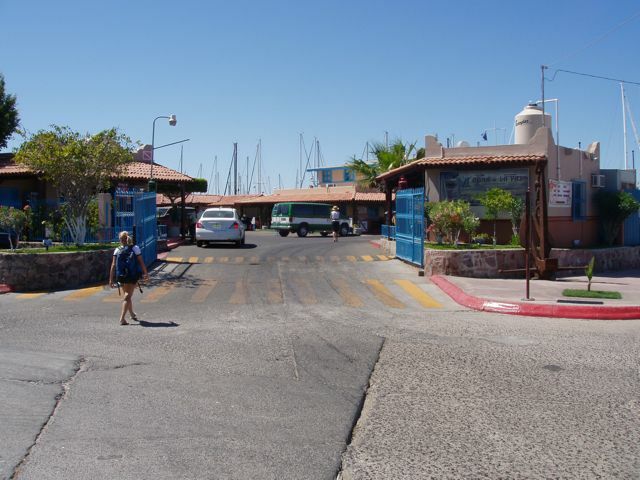 Muelle 4: dock 4. Wings is the third boat on the right side of the dock. 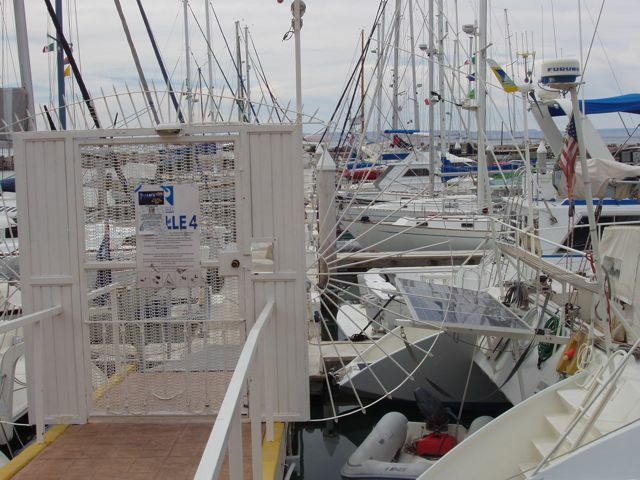 The catamaran you see at right is enormous. There's an equally large one to the left that's from New Zealand. Looking toward the marina proper. The main office, laundromat, showers, and fuel dock are all among the high buildings. Near us is this lovely schooner against the breakwater. 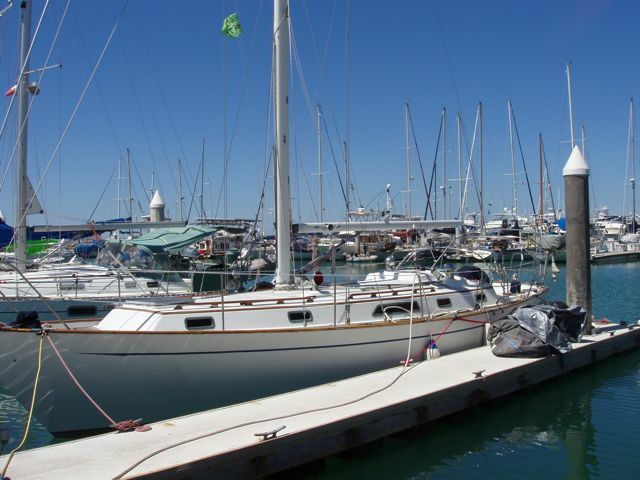 She's less lovely when you see the bent foremast. Yep, it's broken midway between the first and second spreader. Getting there. The bimini is on but the pile of gear on the dock has not diminished. By Saturday, we had her almost done. Only the dodger remains to be attached. She's a cruiser again! 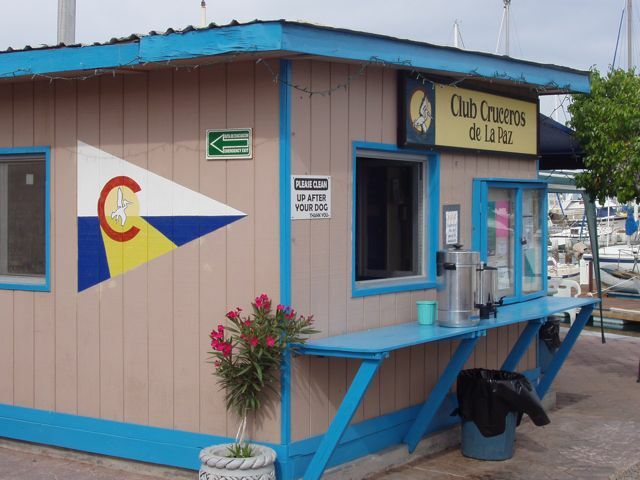 This is where the ex-pats hang: the Cruisers' Club of La Paz. Oh, my! They just do things differently here. Ain't code! Holy smokes! 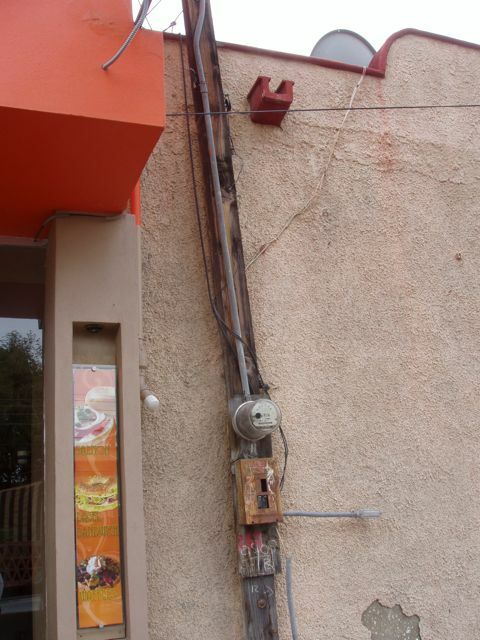 I think that when you need power, you just climb the pole and tap in, or that's how it looks. The best bagels ever! Lovely Conni and I love the place. They serve "hecho a mano" boiled bagels with all the trimmings, and great coffee and tea. The business is owned and operated by a family, all of whom speak perfect English and work VERY hard. 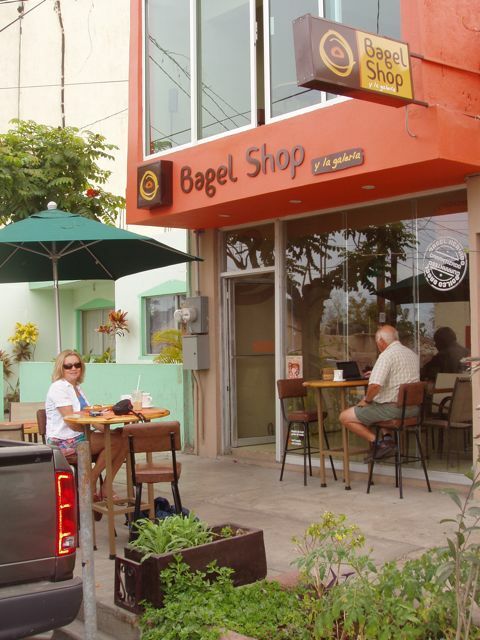 They have a sign near the door: "Bagels de verdad. Gente de verdad" or "Real bagels, real people". We agree. 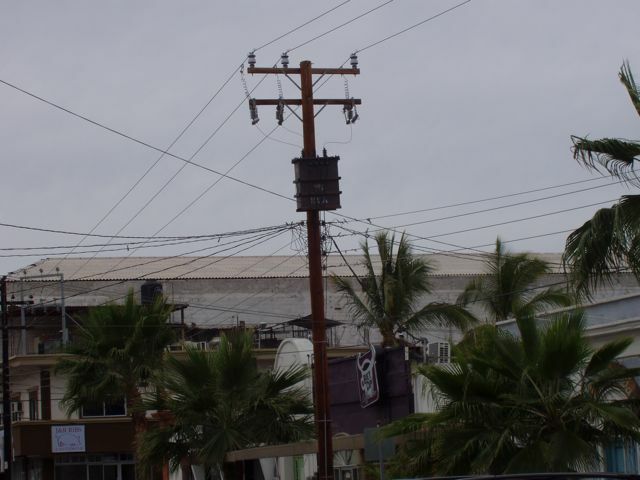 Their clientele is about 50-50 Gringos and Pazenos (locals from La Paz).